Bringing up Muffin: First Day! Muffin's first day of Kindergarten was great! Here's her teacher checking out who's picking Muffin up before releasing her from school. 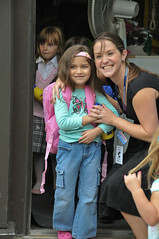 Muffin LOVES her teacher Ms. C, and is really enjoying her school.